The other region that stands out for me is the Odden Ice tongue. This is a tongue of sea ice that used to extent from Greenland out into the Greenland Sea every winter. It was the subject of my PhD and before I started my work some thought it was significant for the ocean circulation. Now, as I said in an interview for the BBC World Service, it is gone. 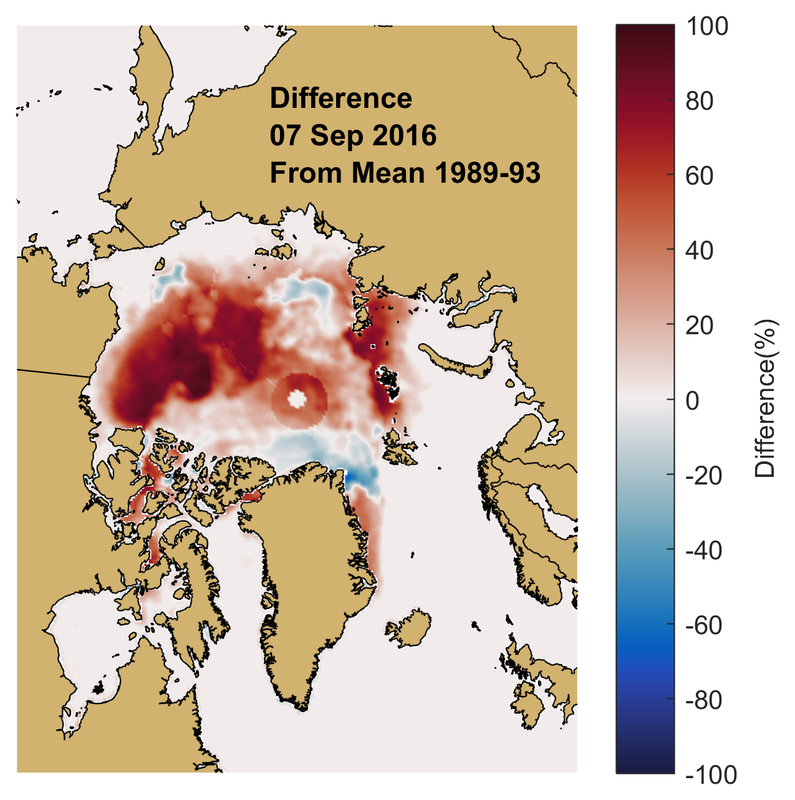 If you compare the summer minimum sea ice extent with my mean (89-03), it is nearly all red. At the summer minimum the difference between the daily ice extent, in each grid cell and the mean based on historical data for the years 1989-93. Blue shades imply more sea ice and reds imply decreased sea ice compared with the mean. The original data come from the DMSP SMMI data set at the NSIDC. The only blue shading in the whole Arctic Ocean that indicates a greater sea ice extent is just north of Greenland. I blogged about this at the beginning of October in a post called Compact Sea Ice on the North of Greenland. This is also the region you expect the oldest and thickest sea ice to be. NASA released an excellent movie of sea ice ages which demonstrates this. We know the sea ice in the Arctic has broken records and there has been a Record Low Arctic Sea Ice Extent as the ice grows in winter. There is an absence of sea ice in the Kara sea and that means means we have about a million km2 less sea ice cover than usual. This is starting to freeze up now although it is still well down on the historical satellite record. So what has happened this winter? I would point you at the excellent UK Met Office Blog post: An expert’s view on unusually warm Arctic temperatures. For completeness here are the anomalies of the sea ice extent derived as before for 2016 up to 24 November.